Posted by Jeff Hammett in bars and restaurants, beer previews, blind lady ale house, breakwater brewing co., chuchills pub, downtown johnny brown's, eleven, encinitas ale house, hamilton's tavern, live wire, neighborhood, o'brien's pub, pizza port, pizza port carlsbad, pizza port ocean beach, pizza port solana beach, stone brewing world bistro and gardens, the linkery, the tap room, tiger!tiger! This post last year about where and when to find Pliny the Younger in San Diego got a ton of traffic and a whole bunch of folks told me it was very helpful. Since I’ve already been asked multiple times if I’ll be keeping a list this year I figured I should start. See last year’s post (linked above) for more info on Pliny the Younger and some notes about how quickly it tapped out at various bars in San Diego last year. Pliny the Younger hits taps at Russian River’s Brewpub in Santa Rosa today according to their website. At the brewpub they have a dedicated number of kegs each day to make sure it lasts until at least mid February (meaning if they’ve sold enough one day it might be gone at 9pm, but they’ll have more on tap the next day when they open). Down here in San Diego we’re not so lucky. Most bars get a limited amount and it goes rather quickly, so if you want to get a taste don’t straggle, and be prepared for long lines, crowded bars (and sometime higher than usual prices for smaller than usual pours). But I think most people would agree, it’s worth the hassle. It should be noted that we probably won’t see Pliny the Younger down here in San Diego for a week or two, I’d guess it will start showing up around town sometime between Feb 8th and 15th. Below is a list of bars that I expect will be getting Pliny the Younger or have confirmed to me that they will be getting it. Any of the information could change, I suggest you check with individual bar’s if you want to be 100% sure, but I’ll do my best to keep this list updated. Blind Lady Ale House – Fundraiser, Monday 2/20/12 from 6-8pm. Tickets must be purchased in advance and will go on sale at 6pm today (2/13/2012). $16 for .25 liter of Younger, .25 liter of Elder and a raffle ticket. Read more about the fundraiser, all the details and buy tickets here. Tickets sold out in approximately ten minutes. Encinitas Ale House – They say they’re getting a full keg, no word on date it will be tapped. O’Brien’s Pub – via their newsletter. 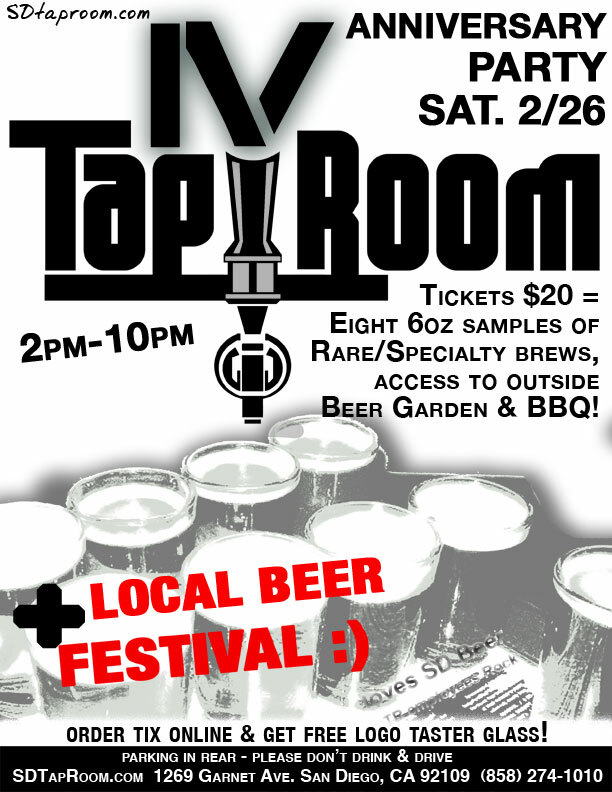 They’ll tap a keg on Saturday 2/11/2012 at 5pm. According to a comment below the keg ran dry after about 22 minutes.They’ll be tapping another keg for a charity event (proceeds going to local animal shelters and programs). There will be a sign up list at the bar, which your will be required to get a pour. Details will follow in their email newsletter next week (week of 2/12/12). They’ll tap another keg on Friday 2/24/12 at 11am. Tap Room – Tuesday 2/21 at 5pm. And again Saturday 3/3 at 1pm for their 5th Anniversary Party. Tiger!Tiger! – Saturday 2/25 12-2pm and Sunday 2/26 11:30-12:30pm. After selling over 100 ticket’s to the Pliny the Fundraiser night at Blind Lady Ale House in only 10 minutes, the folks at BLAH/Tiger!Tiger! were able to score a bit more PtY to make more money for a good cause. Tickets are limited to 75 people per day and go on sale Monday 2/20 at 7:00pm for Saturday and 7:30pm for Sunday. Same deal as before, $16 gets you a .25 liter of Pliny the Younger, a .25 liter of Pliny the Elder and a raffle ticket. (Dates above link to the online sales). Don’t straggle, they’re sure to sell out fast. URGE Gastropub – Probably early March for a Triple IPA night, see comment below from Grant at URGE. Breakwater Brewing Company – 2/10/2012 via Facebook and it’s gone. Eleven – Tonight (2/13/2012) at 8pm. Pre-sale at 7:30pm. Reportedly sold out during pre-sale time, before 8pm tapping. Hamilton’s Tavern – Tapping PtY at 3pm on Wednesday, February 8th. Live Wire – On tap as of 9pm 2/8/12 – via Twitter One person on Twitter says it ran out the same night. Newport Pizza and Alehouse – Wednesday 2/15/2012 at 4pm. A reader wrote in to say that it was gone an hour and six minutes after they first started serving it. Pizza Port Solana Beach – Someone emailed to tell me that they put PtY on last night and as of this writing (2/10/12 at 4:45pm) I see it listed on the tap cam. Gone from the tap cam. Toronado – 10am February 8th (they’ll be putting it on as soon as it shows up) and will tap a second keg when the first one blows per their newsletter. Toronado tapped two kegs, the first at 10am and the second when the first blew. The second ran dry around 12:45pm.They may also be tapping a keg when they open on Sunday at 11:30am. 10oz for $8 on Wednesday, “slightly more expensive” other times they tap it. 6pm tonight (2/14/12) for their last keg of Younger. If you know of a bar or restaurant in San Diego that will be getting Pliny the Younger, or what day/time they’ll be tapping it, send me an email to get the list updated. If you’re looking for Pliny the Younger in Orange County check out Craft Beer Culture’s list here. Pizza Port Ocean Beach is doing a North Coast Brewing Company keep the glass night. Old Rasputin has been one of my stand by beers for sometime while Le Merle and Scrimshaw Pils are recent favorites. They’ll have regular and Belgian-style glasses to take home as well as some other North Coast beers on tap. This Friday is the first ever Friday Afternoon Club (FAC) at Hess Brewing Company. They’ll have live music, catered food and $3 pints in your Hess Brewing Company glass. If you don’t have a glass yet you can buy one for $8 including your first beer. Hamilton’s Tavern will have a cask of Ballast Point Brewing Company’s Tongue Buckler an Imperial Red for Firkin Friday this week. I haven’t had this years batch yet but I hear it’s good. The Tap Room in Pacific Beach is celebrating their 4th Anniversary this weekend with a beer festival on Saturday. $20 gets you eight 6oz tasters. They’ll have a ton of limited and rare beers available for sampling. Lost Abbey is hosting their fourth annual Carnevale, a Venetian-style Carnevale masquerade party from 7-11pm. Beers are all regular price but if you attend in costume food and entertainment are free. Check out their website for pictures from past years, it looks like a good time. The Linkery is celebrating their Sixth Anniversary all weekend long (starting Friday) with their Festival of Sausages and Beer. They’ll have some great stuff on cask and draft all weekend in addition to their solid bottle lineup. They’ll have the declicious and locally sourced Ballast Point San Salvador Saison (which The Linkery helped source ingredients for and brew) as well as 2007 Stone Old Guardian Barleywine and a cask of Black Market Brewing Company Rye IPA in addition to some other great beers. Some stuff may run out, so if there’s a particular beer you’re especially interested in you may want to head down there earlier in the weekend. Up in Escondido Stone Brewing Co. will be filling growlers of 2005 Imperial Russian Stout. This is a great beer with a few years on it, and in Stone’s cellar I’m sure this is holding up just fine. Sunday growler fills can be extremely limited. I’d suggest stopping by in the morning. I haven’t heard of anything special going on. If you know of something please email events@sandiegobeerblog.com to get it added. If you didn’t get enough $3 pints on Monday night stop by KNB Wine Cellars anytime Wednesday when they’re doing $3 beers. Russian River Brewing Co.’s Triple IPA Pliny the Younger is one of the most anticipated beer releases amongst hop head beer geeks. Released just once a year, usually in February the beer is very limited which adds to the intrigue and demand. Last year Russian River sold out of Pliny the Younger at their brewpub in Santa Rosa in about ten hours. This year they changed things up a bit so it will last longer; they aren’t filling growlers, it is available for on-premise consumption only and they have specific allotments for each day, so even if they run out one day, they’ll have another keg to put on the next day so it will be on tap for at least two weeks. But Santa Rosa is quite the drive from San Diego, so thankfully Russian River is sending some kegs down our way. While I appreciate a good IPA or Double IPA I’m not the biggest hop head aound, and I’ve actually never gotten to try Pliny the Younger, but I’m hoping to get a taste this year. In the past lines at San Diego bars have been long when Pliny the Younger is released and a full keg blew at O’Brien’s Pub in about 45 minutes a year or two ago. So it might be a hassle to get some, but from what everyone says it’s worth it. I’m unsure of how many kegs will be sent to San Diego, and exactly which bars will be getting it, but below is a list of the bars I do know that are getting it, as well as my best guesses on which other bars might get some Pliny the Younger and those that got some last year. It’s expected that the kegs will be arriving in San Diego this week, maybe even as early as tomorrow, Wednesday February 9th. UPDATE: According to Ian Black at Toronado the first kegs of PtY did indeed arrive at Stone (they distribute Russian River in San Diego) Wednesday and should start going out to bars Thursday. I’m told that there will probably be at least two different shipments of kegs down here, so we could see Pliny the Younger start showing up at bars this week and then again in a week or two. This is all subject to change and you should check with individual bars for more info. But I’ll try to keep this list as up to date as possible. If I hear of any bars tapping additional kegs at a later date I’ll post that info as well. Toronado – Thursday, 2/10 at 10am UPDATE: The first keg ran out around noon, they tapped a second keg which ran out around 3pm. They had another keg on when they opened at 11:30am Sunday 2/13. Stone Brewing World Bistro and Gardens – Thursday, 2/10 at 4:30pm UPDATE: Their keg kicked around 5:45pm. I’ve heard second hand that they have two additional 1/2 barrel kegs. O’Brien’s Pub – Saturday 2/12 at 4pm UPDATE: I heard the keg kicked in just over 20 minutes. Blind Lady Ale House – Tuesday 2/15 at 5pm UPDATE: BLAH had a 1/2 barrel keg which was emptied in about an hour. Great Divide Brewing Co. is one of my favorite Colorado breweries that doesn’t get distributed in California, but that’s about to change next week. Stone will be distributing Great Divide in San Diego and they’re hosting kick off parties at bars and restaurants throughout Southern California next week. Great Divide’s founder Brian Dunn will be on hand at some of the releases in addition to the many delicious Great Divide beers. Wednesday September 29th they’ll kick things off at KNB Wine Cellars in Del Cerro from 5-8pm. They’ll have an awesome line of Great Divide beers, on tap will be: Titan IPA, Hercules Double IPA, Yeti Imperial Stout, Hibernation Old Ale, Smoked Baltic Porter, Hades Stong Belgian Pale Ale. All of those minus Hades will be available in bottles (either 12oz six packs or 22oz bombers) and they’ll also have bombers of Old Ruffian Barley Wine and Espresso Oak Aged Yeti. The next night, Thursday September 30th, they’ll be up north at Churchill’s Pub and Urge Gastropub with many of the same beers on draft. Friday, October 1st Blind Lady Ale House, The Tap Room and possibly Neighborhood will be hosting and tapping some Great Divide Beers. Saturday, October 2nd they’ll finish things out at Pizza Port in both Ocean Beach and Carlsbad. For you LA folks, it looks like they’ll be at Blue Palms for a lunch event Wednesday Sept 29th. Thursday they’ll be at Farmer’s Harvest and Beachwood BBQ. Friday October 1st they’ll be at Whole Foods in Tustin and Saturday they’ll stop by 38 Degrees. All the events are subject to change, please check with the individual establishments to confirm times.